Colleen O’Brien-Berglund began working at Interfaith Action of Greater Saint Paul in November 2017 as the Program Assistant for Project Home. In this position, she works with staff, volunteers, and families to ensure the program runs smoothly at each shelter site. She also serves as Interfaith Action’s afternoon receptionist. Colleen has been a Project Home volunteer since reading about the program in the Cretin-Derham Hall Alumni magazine. She is excited to have a more active role in the program and be more involved with helping homeless families in the Saint Paul area. Colleen was born and raised in Saint Paul. She attended St. Catherine’s University and graduated with a degree in nursing and recently completed the Community Health Worker certificate. 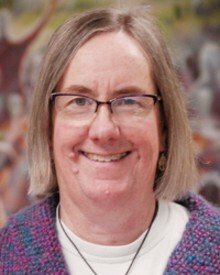 She is active in her community, serving on the Board of Directors of Friends of Willow River and Kinnickinnic State Parks and volunteering at Operation HELP and many other organizations. She moved to Hudson after she got married. Colleen and her husband, Jon, attend Bethel Lutheran Church. They have two children, Brien and Erin, and two dogs and one cat. In her free time, she enjoys reading, knitting, hiking, biking, and spending time with her family.